Department of Hematology, All India Institute of Medical Sciences, New Delhi, India. Received: August 1, 2017; Revised: August 27, 2017; Accepted: September 10, 2017; Published online: December 17, 2018. Snapper-Schneid granules are azurophilic inclusion bodies in the plasma cells, named after the scientist who discovered them in myeloma cells after treatment with stilbamidine. Recently, they were identified as being lysosomal in origin and are mostly observed as one of the morphological variants of myeloma. A study even demonstrated an increase in these granules on disease progression. We present a case of a 68-year-old man with bilateral lower limb paresthesia and backache for 1 month. His renal function test showed mildly elevated creatinine and blood urea nitrogen (BUN) levels (creatinine, 1.8 mg/dL; BUN, 35 mg/dL). However, his serum calcium level was within normal limits (9.2 mg/dL). A hemogram showed only anemia (hemoglobin, 6.7 mg/dL; total leukocyte count, 5×109/L; platelet count, 170×109/L). A peripheral smear showed normocytic normochromic red cells with no rouleaux formation. Bone marrow aspiration and biopsy were performed to exclude multiple myeloma. On myelogram, plasma cells constituted 20% of all nucleated cells. 80/100 plasma cells (80%) counted showed the presence of coarse azurophilic granules called as Snapper Schneid granules (Fig.). 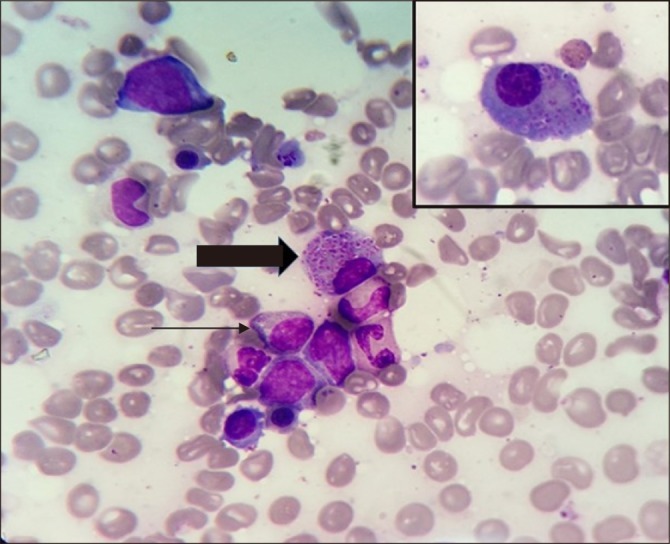 Snapper Schneid granules in plasma cell (arrow). Note the difference from immature myeloid cell granules (thin arrow). Inset shows a typical plasma cell with coarse azurophilic granules. (Jenner Giemsa stain, ×100). Immunohistochemical analysis of the bone marrow biopsy showed a polyclonal distribution for kappa and lambda. No monoclonal band was detected on serum protein electrophoresis; a serum-free light chain assay was performed, and the level was within normal limits (0.65; normal range, 0.26–1.65). All of these tests suggested reactive plasmacytosis. Meanwhile, skeletal survey was conducted and revealed negativity for a lytic lesion. In conclusion, Snapper-Schneid inclusions may not be restricted to myeloma cases.